Order A. Vogel (Bioforce) Molkosan ® 200ml from the Online Health Food Store UK. Buy A. Vogel Molkosan ® Original 200ml and other quality Digestive Aids safely online in the UK. Made from whey obtained from organic milk, Molkosan® is rich in a substance known as L+ lactic acid which is now known to support the growth of good gut bacteria. In this way, it acts as a prebiotic. Where to buy A. Vogel (Bioforce) Molkosan ® 200ml safely online? Shop at the Online Health Food Store if you are wondering where you can buy A. Vogel Molkosan ® Original 200ml safely online in the United Kingdom. 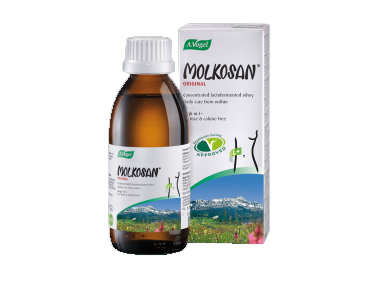 Molkosan ® 200ml - A. Vogel Molkosan ® Original 200ml in Digestive Aids and Herbal Remedies, Tinctures & Supplements.